This compact reg is an exceptional all-around breathing system targeted to beginning divers as well as travel divers. 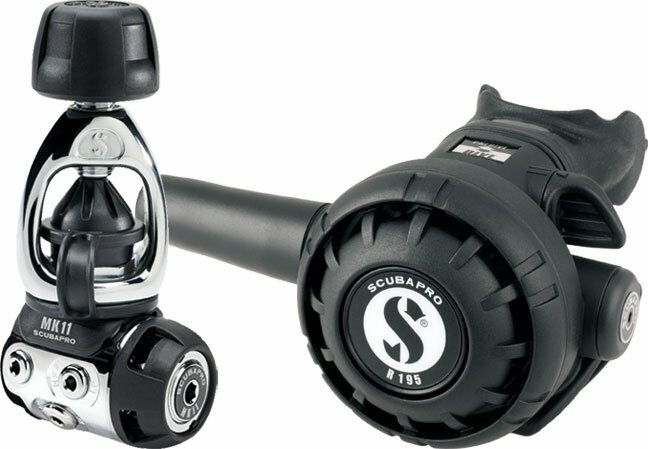 An excellent choice for diving temperate or warm waters, the time-proven MK11/R195 pairs the compact, balanced diaphragm first stage with a very user-friendly second stage. The result: a durable breathing system that's easy to use and delivers air efficiently, all at a price that won't bust your budget. The balanced diaphragm MK11, with its chrome-plated brass body specially designed to reduce size and weight, is an ideal travel companion. Its system features internal parts that are sealed from the elements, increasing reliability and performance. The MK11's polished chrome forged brass body features identical high pressure and low pressure ports on each side so you can hook it up to your tank in either the up or down position while maintaining the same port layout. Also, two of the low pressure ports are high-flow, delivering about 15 percent more air than the standard low pressure ports. This means lots of effortless airflow with every breath. The R195 is a modern second stage design based on the time-honored R190. The R195 combines a classic downstream valve with a large diaphragm, functional purge button and VIVA switch for smooth and easy operation. It brings a welcome simplicity as well as proven performance. The MK11/R195 travels well, is easy to use and moves air efficiently. It's an exceptional all-around air delivery system for diving temperate to tropical waters. Marine brass body has internal parts that are sealed to prevent water and pollutants from fouling the inner mechanism while enhancing cold-water performance. Weight: INT 232 - 25.0oz/710g.